Danger of losing his business, Anthony Roca, an ordinary man, develops a scam that will become the heist of the century. Overtaken by the crime, he will have to deal with betrayal, murder and settling. 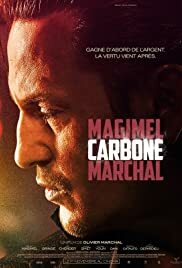 The title of this dark thriller CARBON comes from the fact of France trying to limit carbon emissions by industrial companies. One such company that meets the quota belongs to the protagonist of the film, Antoine Roca (Benoît Magimel), Unfortunately the firm is in huge debt and he cannot meet the daily cash flow. It is a family business from his in-laws who treat him as a loser. 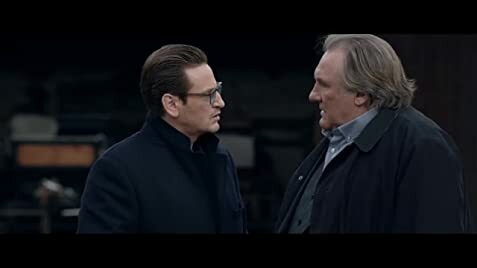 His father-in-law is played by no less than Gerard Depardieu who is a real meanie in the story, belittling Antoine and cutting him off from his son. Antoine’s wife is not sympathetic either. Faced with the threat of losing his firm, Antoine mounts a scam which will become the burglary of the century. Entangled with gangsters, he must cope with betrayal, murder, and settling of scores. The selling of carbon is a bit confusing but the film still works as an entertaining thriller. Depardieu shows his star power stealing every scene he is in.